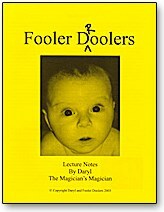 Didn't have a chance to see Daryl's lecture at the 2003 Blackpook Magician's Convention? No problem, you can still get the notes! These detailed notes contain all of the effects featured in the lecture presented by Daryl (which had over 3000 magicians in attendance). Contents include: Happy Birthday Card, The Gun Trick, Pyro-Maniact, Rising Cards from Envelope, Card in the Envelope, Mystery of the Traveling Marbles, Two Cards in the Eye Glasses, and Ring, Rope, Wand. These are all excellent effects and most of the routines are surprisingly easy to perform.